iPhoto is the most advanced image editor available on a touch-screen device. It’s packed with powerful image manipulation tools, context-sensitive controls and social features. As a result it’s the perfect tool for photographers on the go, or anyone looking to quickly improve a photo. This is the main interface window for iPhoto. From here you can edit images and share them with friends and family. On this page you’ll discover the basics of using the iPhone interface. Read on to find out more about a button or feature. Show or hide the thumbnail grid by tapping this button. Send an edited image to a wide range of sources using this button. You can create a Journal, email an image, beam it to another iDevice, print it wirelessly, create a slideshow, export to the Camera Roll on your device, send to iTunes, iMovie, Flickr, Twitter and Facebook, create a card (using a third-party app), or open the image with another compatible app on your device. Tap this button to enable the editing tools in iPhoto. The editing tools will appear at the bottom of the screen. This large preview window in the centre of the screen will display the image in its current state. It updates in real-time as you work, so you can always see how the image will look when exported or shared. Slide through thumbnails of other images on your device. 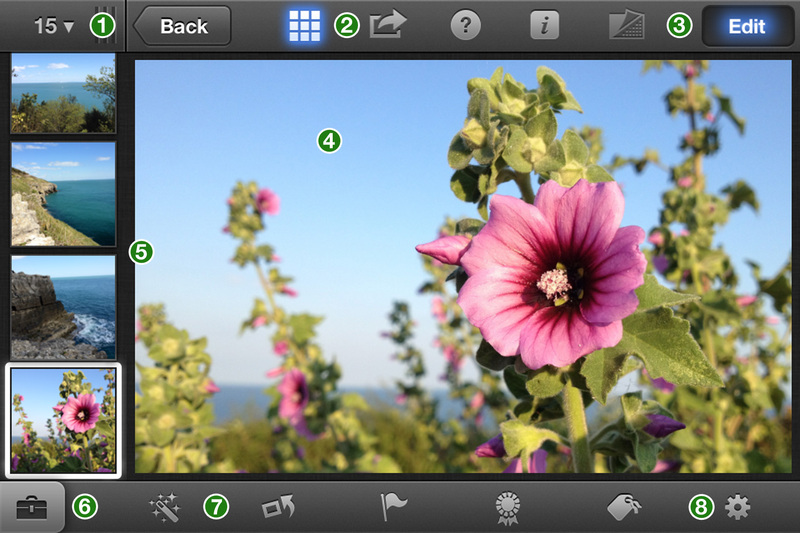 Tap on an image to select it, or tap on two or more using multiple fingers to compare them. You can widen and shorten the thumbnail view to accommodate more images, by dragging the top bar with your finger. Tap this toolbox icon to reveal the many advanced editing features included with iPhoto. They include the ability to crop and straighten the image, alter its exposure, change the colors, edit the image using brushes and apply visual effects. This clever tool will instantly analyze the image then improve its appearance by changing the brightness, contrast and exposure. It can scan for faces and brighten them in dark images, or tweak skin colors to make people look more natural. This button enables you to undo specific edits, hide photos, copy and paste adjustments and select custom settings for edits (for example choosing a ratio size when cropping an image).